Alumni reception at the ASSA Annual Meetings in Philadelphia. From left to right: Marina Gindelsky, Paul Carrillo, Stephen Popick, Tara Sinclair, Bryan Stuart and Tony Yezer. Welcome to the spring newsletter! Several interesting events have taken place since our fall newsletter. 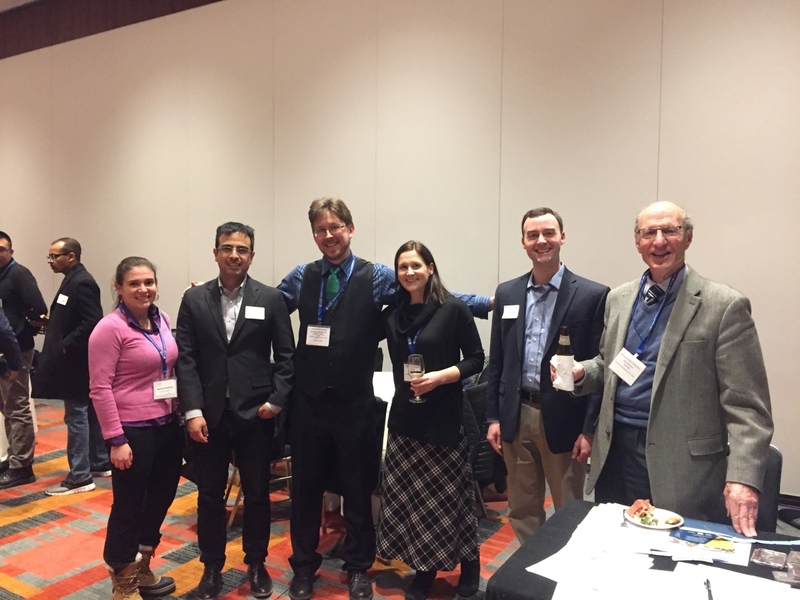 The department hosted an alumni reception at the 2018 ASSA Annual Meetings in Philadelphia. It proved to be a lively affair attended by both former and current students. The department was also engaged in recruitment at the Annual Meetings and we will be welcoming two new faculty this coming academic year: Steven Hamilton (University of Michigan) and Daniel Mackay (University of Virginia). Our faculty and students have continued with their successes and the newsletter lists some of their accomplishments. We are extremely grateful to alumni and friends whose generous donations have contributed to the success of our students and our academic programs. Professor Bryan Boulier is retiring after a long and distinguished career. He joined the department in 1981, and played an important role in its development as a leading center for research and teaching, particularly as department chair and later director of undergraduate studies. 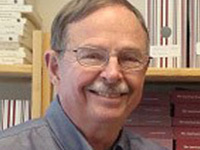 His international reputation as a leading scholar in the field of economic demography drew recognition to the department as a leading center for research. He taught and supervised a number of doctoral students who went on to make important contributions in the areas of demography and development. 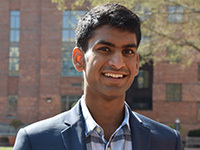 He also trained scores of undergraduate students in core microeconomic theory as well as guided many through their first independent research experience in the capstone Proseminar in Economics. A number of undergraduates went on to publish joint papers with him in highly regarded academic journals. The faculty and students would like to thank Professor Boulier for his contributions to the department and the university and wish him the best. Richard Brown, PhD '94, rose to become chief economist at the Federal Deposit Insurance Corporation (FDIC). 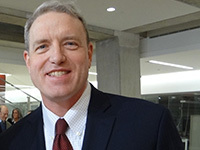 He became a member of the Advisory Board of the Department of Economics Alumni Advisory Committee shortly after it was founded by Stuart Harshbarger, MPhil '93, PhD '94, and actively participated in meetings and helped with a variety of committee assignments. In 2013 he took over as head of the board and spearheaded a number of efforts to improve communication with members. He also advised the semi-annual alumni lecture and reception. He was instrumental in securing distinguished speakers such as Sheila Bair and William Issac, both former chairs of the FDIC. The department would like to thank Richard for his tireless efforts in developing and expanding the alumni network of economics. The department was eager to have Anh Nguyen, BS ’12, and John Soriano, BS ’13, speak with undergraduates about their experiences in economics graduate school programs. Anh and John provided guidance and perspectives, and answered questions from economics majors about how to prepare for and succeed in grad school. 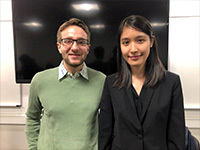 Thanks to Anh and John for volunteering their time and advice, and to Professor Yezer and the GW Omicron Delta Epsilon honor society for hosting this informative and engaging event. Professor Irene Foster was named the Student-Athlete 2017 Professor of the Year. She was also named GW Hatchet's Best Professor in 2018. 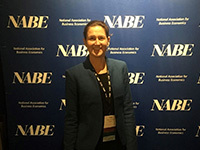 Professor Tara Sinclair spoke about "Evaluating the Quality of New Data Sources" at the National Association for Business Economics Tech Economics Conference in Seattle. Professor Tomas Williams published “Capital Flows and Sovereign Debt Markets: Evidence from Index Rebalancings” in Journal of Financial Economics and “Capital Inflows, Sovereign Debt and Bank Lending: Micro-Evidence from an Emerging Market” in Review of Financial Studies. Professor Remi Jedwab published “The Urban Mortality Transition and Poor Country Urbanization” with Dietrich Vollrath in American Economic Journal: Macroeconomics. Professor Steven Smith is on sabbatical at the UNICEF Office of Research-Innocenti, in Florence, Italy, where he is a UNICEF Senior Fellow. He is researching impacts on child outcomes of constraints that apply specifically to women, particularly mobility restrictions, low influence on family spending, domestic abuse, limited access to information and gender-specific credit and ownership constraints. Trenton Jin at the (APPAM) Regional Student Conference in California. 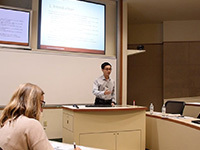 Trenton Jin presented his research at the Association for Public Policy Analysis and Management (APPAM) Regional Student Conference in California. A number of our graduate students presented their research in various conferences and we thank our alumni whose generosity has made conference travel possible for students. 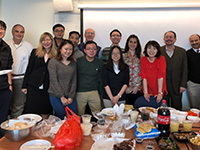 Economics faculty and grad students gathered for a potluck to celebrate the Lunar New Year! This fun event was arranged by the GW Student Association for Graduate Economists (SAGE). The department will be announcing the Dunn Prize for the best undergraduate paper in international trade, and the Kendrick Prize for the best graduate paper in macroeconomics and monetary theory later in the spring semester. College Factual has ranked GW Economics in the 31st position out of 442 programs nationwide. The department's MA in Applied Economics Program is a big success with more than 50 active students and 20 graduates in the first two and a half years. The spring GW Alumni Lecture Series in Economics featured Professor Jay Shambaugh who is also director of The Hamilton Project and Senior Fellow at Brookings. The Student Association for Graduate Economists (SAGE) is organizing the second GW Student Research Conference in Economics. This follows the success of the first conference and is already attracting attention from doctoral students around the country. Join alumni, families and friends in welcoming GW's 17th president, Thomas J. LeBlanc, to the GW community. President LeBlanc will share his vision for GW as we enter our third century, and will take questions from the audience. A reception will follow the 7:15 p.m. discussion. Ana Isabel Abad Bagnasco, BA ’17, is currently working as a Latin America researcher at Eurasia Group where she helps her team identify relevant regional trends while closely following the Mexican election, NAFTA negotiations, and Argentina's reform agenda and how it impacts markets. Josh Altman, BS ’12, is currently a United States Army officer serving in Afghanistan with the 82nd Airborne Division. Ashok Bajpai, BA ’88, is in New Delhi, India, and is the MD of Apollo Hospitals, the country's largest private healthcare provider. He and his wife Rajni have two kids each. They will soon be empty nesters, with their youngest leaving for college this fall. Earlene Baumunk-Cancilla, BA ’56, has been a docent at the Princeton University Art Museum for nearly 15 years. She lives in town, plays piano, travels and enjoys New York plays and concerts. She worked in government contracting before retirement. Berk Baycan, BA ’15, has started to work as an analyst at Weber Shandwick Turkey, a leading global communications and consultancy firm headquartered in New York. He has been assisting multi-market clients in finance, energy, aviation, defense and chemical sectors. Ryan Buffkin, BA ’09, is currently corporate counsel for alternative capital and investments at XL Catlin Ltd., a global reinsurance company. His practice focuses on venture capital and structured financial product transactions. Alexander Carre, BA ’17, was hired directly from being an undergraduate by Booz Allen Hamilton and is now a management consultant for the federal government in Washington, D.C.
Lisa (Baldesweiler) Casa, BS ’08, is currently an attorney in the Long Island, N.Y., office of Forchelli Deegan Terrana LLP. She focuses her practice on labor and employment issues on the management side. George Cook, BS ’09, recently graduated with an MBA from Dartmouth where he co-founded a startup. He is currently the CEO of Honeycomb Credit, a platform that allows locally owned businesses to borrow expansion capital from their own loyal customers. Bob Costello, BA ’76, has spent almost all of his career in investment management. Currently Bob spends his time in Michigan (Grand Rapids & Frankfort) and in the Chicago area, helping people with their personal investments. Philip “Phil” H. De Turk, BA ’54, PhD ’56, is now living in North Carolina where he retired in 2002. Prior to that he practiced law in Washington State for 50 years having also received his JD from GW. Ashton DeLano, BS ’17, still lives in D.C. while working as a full-time project analyst for BAE Systems in their Maryland offices. At the same time, he is pursuing a graduate degree in data science full time and intends to finish it by the end of spring 2019. Guoliang Feng, PhD ’15, is an economist at China Investment Corporation, the sovereign wealth fund of China. Thomas Fratkin, BS ’17, has been performing behavioral economics research for a D.C. startup called Creative Science Labs. He has also been studying for the GRE, applying to master’s economics programs in LSE & the University of Amsterdam, and has been writing a memoir! Stephen Geisler, BA ’97, went on to receive a JD from the University of Alabama School of Law and is now in the legal department of BBVA Compass. Lowell M. Glenn, PhD ’74, is the chair of the Department of Finance and Economics in the Woodbury School of Business at Utah Valley University. He oversees a nationally known PFP Program and Finance degree with high success rates of students taking the CFA exam. Austin Hansen, BA ’17, is currently employed as a business analyst with Deloitte Consulting LLP and is working on autonomous vehicle policy with the Federal Motor Carrier Safety Administration. Michele (Walk) Hansen, BA ’12, is now running a software-as-a-service startup that focuses on geocoding and data matching, Geocodio. She is also working on her MBA at Virginia Tech in Falls Church. Paul Helmkamp, BA ’17, is working as a financial advisor at Merrill Lynch, in Northern Virginia. Ann Hollingshead, BA ’08, is currently a senior fiscal and policy analyst at the Legislative Analyst's Office, the nonpartisan fiscal and policy adviser to the California Legislature. She covers issues related to the overall condition of the state budget. Zhaoyang Hou, PhD ’10, is working at Georgetown University in Qatar as an assistant professor of economics. Molly Jacobs, PhD ’15, was recently hired as an assistant professor at East Carolina University. Robert King, PhD ’87, is retired after 30 years with the World Bank. He sits on multiple nonprofit boards, provides pro-bono counseling services to nonprofit executive directors and board chairs and is an active volunteer with the National Park Service. Jason Kofinas, BA ’05, is currently in practice as a reproductive endocrinologist and infertility physician in New York. Shuyang Liu, MA ’15, is living in Beijing right now, and working in the State Information Center. Nicole (Wilder) Maaguo, BA ’04, started a boutique tech consulting firm named Cultivate Ink, LLC in November 2017. The firm specializes in project management, product development and customer success consulting. Giovanni Marquez, BA ’92, supported the World Health Organization/Health Emergencies Programme humanitarian crisis response in northeastern Nigeria. Gerald Miller, MA ’88, has been advising healthcare and life sciences executives on mergers and acquisitions integration and performance improvement after retiring as a principal of Deloitte Consulting. Marjie Mogul, BA ’87, is the senior director of research at the Maternity Care Coalition in Philadelphia, where she evaluates the evidence-base of programs serving at-risk pregnant women and young families. She lives in Audubon, Penn., with her husband and shelter mutts. Kirt (Nelson) Nilsson, BA ’92, is COO of Charter School Capital, a niche financing organization empowering charter schools across the nation through working capital and facilities financing. He is actively involved in Social Venture Partners Portland to get every kid ready for kindergarten. Paul Organ, BS ’14, is in the first year of a PhD program at the University of Michigan, studying economics and business, and planning to focus in public finance. Jason Peuquet, BA ’09, received an MPP degree from Harvard University in 2016 and has since been working as a senior economist at the Colorado Public Utilities Commission. He uses the economics principles he learned at GW every day. Solomon Polachek, BA ’67, is a SUNY (Binghamton University) distinguished professor. His recent article in the Journal of Health Economics on “Why Babies Might Benefit From Looking Like Their Dads” was featured in the Wall Street Journal and other publications. Melissa Pollak, MA ’79, worked at the National Science Foundation (NSF) for almost 30 years and retired in 2010. At NSF, she wrote chapters of the NSB report “Science & Engineering Indicators,” specializing in public attitudes toward and understanding of science. Troy Quast, BS ’95, is in his third year as an associate professor at the University of South Florida College of Public Health. Ahmed Rostom, PhD ’16, earned his PhD in economics from GW after six years of continuous hard work and joined the World Bank to contribute to bringing prosperity to the poor and most vulnerable across the globe. 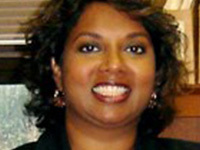 Kavi Sagunarthy, BS ’02, is a general dentist in private practice. He established his practice in 2011 in Fort Mill, S.C.
Steven (Ira) Shapiro, BA ’86, is practicing food and drug law as counsel to Rivkin Radler LLP in New York City. Cornelia “Cornie” J. Strawser, PhD ’83, retired from the House Budget Committee in 1994 and from editing Business Statistics of the U.S. in 2014. She lives at Goodwin House-Baileys Crossroads and writes letters to the editor when United States economic history is misrepresented. John Swanson, MA ’87, is working for a defense contractor doing ship acquisition, science and technology for the United States Navy. Sarra Talib, BA ’04, based in London, has launched and has been managing an innovative advisory programme for agribusiness clients of the European Bank for Reconstruction and Development (EBRD), in the bank's Southern and Eastern Mediterranean region. David Touger, BA ’81, has been practicing criminal law in NY for the past 33 years and is currently a partner in a small law firm. Xinhao Wang, MS ’17, is applying for a PhD. Ellen Welsh, BA ’74, is completing her twentieth year as institutional client portfolio manager at Seix Investment Advisors focusing on High Yield bonds. Noah Yosif, BA ’15, is an economist with the U.S. Bureau of Labor Statistics. The Department of Economics would like to gratefully acknowledge the following generous donors who made a gift to the department from January 1, 2017 – December 31, 2017. Gifts to the Department of Economics allow us to provide support for faculty and student research and travel, graduate student fellowships, and academic enrichment activities including guest speakers, visiting faculty, and symposia. Each gift, no matter how large or small, makes a positive impact on our educational mission and furthers our standing as one of the nation's preeminent liberal arts colleges at one of the world's preeminent universities. The department, in collaboration with several dedicated alumni, has established three funds to further its strategic goals. To learn more about the funds, click here. To donate to any of these funds, please click directly on the fund name listed below. A reunion celebration is only a success if your classmates come back to celebrate with you. 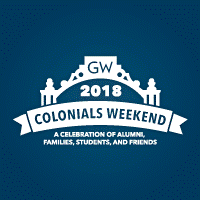 We need a strong group of reunion ambassadors who are willing to help create a buzz leading up to Colonials Weekend. No matter the amount of time you are able to commit, we have an opportunity for you! Email [email protected] to learn more. 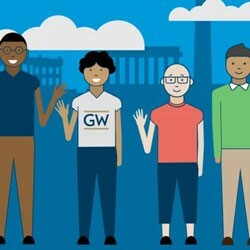 There are several ways to be a GW volunteer, including representing the university in a region, mentoring current students, becoming a social media ambassador, taking on leadership roles within your school, and more. Learn more about these opportunities and grow your GW network today. 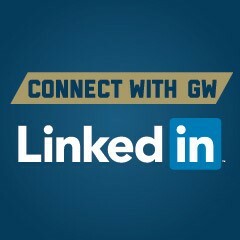 Connect with the GW Economics Alumni Group on LinkedIn!